Edvard Sasun’s lineage is as important as his works. He does not try to conceal his links with the traditions of the Russian Art Academy or his influences. On contrary, he is not afraid of treating motifs already painted repeatedly by many classical Russian artists such as the ‘moodscapes’ of Issac Levitan, the moonlight seascapes of Ivan Aivazovsky and landscapes of Konstantin Korovin (see footnote). As in their paintings, Sasuns work depicts spring, sunsets, seascapes and moonlights and lyricism is a constant feature echoing his artistic aspirations and human inclinations within his landscapes. Similarly so for his portraits, his sense of responsibility and ethical genre are similar to the outstanding portrait painters of the past - the Dutch and Spanish masters of the seventeenth century such as Rembrandt and the Russian Realist masters of the eighteenth century, the outstanding Repin and Valentin Serov. Sasun’s Russian tutorage at the Repin Institute of Painting, was all influential in Edvard being the artist he is today. The Russian Acadmeny of Arts, informally known since 1991 as the St. Petersburg Academy of Art, houses the The Repin Institute of Painting, Sculpture & Architecture in Moscow. The Arts Academy was founded in 1757 and is the largest arts educational institution and one of the most important scientific centers in Russia. For almost two and a half centuries the Academy has been promoting the traditional and neoclassical style & technique of fine art of Russia and plays a key part in the preservation of its native style. 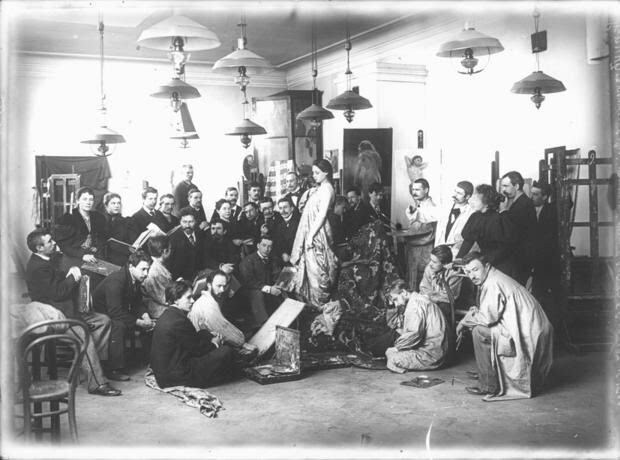 The history of the Academy is closely connected with the history of Russian Fine Arts. There were periods of real flight, when the Academy was the only authority arbiter in the field of artistic policy on the development of Russian artists. However along all its history, the St Petersburg Academy of Fine Arts has been the largest artistic school in the world that train outstanding masters of Fine Arts. It's remarkable that students often worked with the teachers who as a rule were the greatest artists of their time. Repin was one such artist, the foremost of Russia’s Realist artists of his time. Such was his greatness, the building in Lennigrad was named in his honor and became the Repin Institute of Painting Sculpture & Architecture. Ivanov Repin was born on the 5th August 1844 in the small Ukrainian town of Tchuguev into the family of a military settler. At the age of 19 he entered the St. Petersburg Academy of Arts. His arrival in the capital coincided with an important event in artistic life of the 1860s, the so-called ‘Rebellion of the Fourteen’, when 14 young artists left the Academy after refusing to use mythological subjects for their diploma works. They insisted that art should be close to real life and formed the “Society of the Peredvizhniki” to promote their own aesthetic ideals. His realistic works often expressed great psychological depth and exposed the tensions within the existing social order. It is interesting to note here the parallel of what was, or was not accepted by the Academy a century later as an appropriate subject matter for the diploma. Edvard,’s diploma work was ‘Refugee’, which depicted the Genocide of Armenia and caused much controversy amongst board members and was only accepted after the defense of Boris Ugarov. In 1873 Repin sojourned in Italy and lived in Paris for a time where he was exposed to French Impressionist painting, which had a lasting effect upon his use of light and colour. His style was to remain closer to that of the old European masters, especially Rembrandt , and he never embraced Impressionism. He felt that Impressionism was a dangerous departure from “the truth of life”. Throughout his career, Repin was drawn to the common people from whom he traced his origins. He frequently painted country folk, both Ukrainian and Russian, though in later years he also painted members of the Imperial Russian elite, the intelligentsia, and the aristocracy, including Tsar Nicholas II. Beginning in the late 1920s, detailed works on him were published in the USSR, where a Repin cult developed about a decade later, and where he was held up as a model "progressive" and "realist" to be imitated by "Socialist Realist" artists in the Soviet Union. The last quarter of the 19th century is the most notable period in Repin’s work, though he continued to work well into the 20th century. After the Bolshevik Revolution in 1917, he lived and worked in Finland, where he died on September 29th 1930. Today there is a Repin Museum there in his honour. Valentin Serov A former student of Repin, who has had a great influence on Sasun, is Valentin Serov. He was considered to be the greatest portraitist of his time and is extremely revered both in Russia and abroad. Serov continued the traditions of late nineteenth-century realist portraiture, which were made richer by the achievements of Impressionism. It is interesting to note that while creating his early unsurpassable works, that resemble Renoir in a way, he did not know about the existence of the new trend called ‘Impressionism’. Valentin Alexandrovich Serov was born on January 19th 1865 into the family of a Russian composer and musical critic Alexander Serov. In 1871 his father died and the following year, as a little boy he moved to Munich with is his mother where he took lessons from the artist K. Kepping. In 1874 they moved to Paris, where Valentin regularly visited the studio of Ilya Repin and worked under his guidance. In 1875 Serov moved near to Moscow and at the age of 15 entered St. Petersburg Academy of Fine Arts in the class of professor Pavel Tchistyakov. His first exhibited works, Girl with Peaches. Portrait of Vera Mamontova (1887) and Girl in the Sunlight. Portrait of Maria Simonovich (1888), were a sensation. Critics called them a new word in painting. Serov’s work was greatly influenced by the European painting of old masters and his brilliant gallery of portraits are now among the most treasured exhibits in the Russian Museum in St. Petersburg. Valetin was a true teacher who gave Russia a number of different, but equally gifted painters. He was an artist who paved the way for others and, above all, he was one of the great masters that led Russian art into the twentieth century. He died in Moscow on December 5th 1911. Boris Ugarov One such artist to follow on from both Repin & Serov, and someone who represents the last generation of social realism masters, was Edvards' teacher Boris Ugarov. Ugarov was born in 1922 in Leningrad and died there in 1991. He was a painter and graphic artist and a full member of the Academy of Arts of the USSR and the People's Artist of the USSR in 1982. From 1952 he taught in the Academy of Arts; became professor from 1971 and president from 1977-83. In 1975-79 he was elected the chairman of the Leningrad organization of the Artists' Union of the RSFSR. Ugarov created paintings on the Great Patriotic War of 1941-45, genre scenes, city and village landscapes, still lifes, and portraits including ‘A Leningrad Woman in 1941 executed between 1961-62; Spring in the Volkhov Front, 1971; Composer Andrey Petrov, 1971; and Alexander Pushkin, 1985 amongst others. Ugarov's works are represented in the State Russian Museum, the State Tretyakov Gallery, and other museums of Russia. Edvard has the greatest respect & admiration of Ugarov and his tutorage and like many artists before him, this schooling has guided him along a similar path travelled by many of the great Russians masters of the last two and a half centuries. It is never easy to compare great masters from the past with the artist of modern times. However one only has to look at Edvards paintings to see the thread that connects the past and present. The influence and teachings that these great artists had on Edvard's work is evident in his understanding of the fundamental principles of painting, of moral and aesthetic values as well as his attitude to tradition and contemporary reality. One cannot confuse his work with any other artist. A.P.Losenco, F.S.Rokotov, D.G.Levitsky, O.A.Kiprensky, V.A.Tropinin, S.F.Stchedrin, K.P.Brulov, A.A.Ivanov, P.A.Fedotov, I.N.Kramskoy, V.I.Surikov, I.I.Brodsky, I.E.Grabar, M.B.Grekov, and K. Korovin. Footnote: In June 2011 a painting by Ilya Efimovich Repin " A Parisian Cafe" was sold at Auction for U$ 6,572,000 at Christie's London. Konstantin Korovin studied under Repin between 1896 - 1903. Korovin’s painting “Boulevard Montmartre’’ was recently auctioned in June 2011 London for £249,500.